A Chicago federal judge on Thursday reinstated a lawsuit alleging that a virulently anti-Israel group and several of its activists are "alter egos and/or successors" of a defunct U.S. based Hamas-support network previously found liable for the murder of an American teen in a 1996 terror attack. American Muslims for Palestine (AMP) routinely sponsors conferences that serve as a platform for Israel bashers, and openly approves "resistance" against the "Zionist state." One AMP official acknowledged the goal is to "to challenge the legitimacy of the State of Israel." AMP is also one of the principal advocates of the Boycott, Divestment, and Sanctions (BDS) movement against the Jewish state. Its BDS campaigns include: Ramadan Date Boycott, SodaStream, Stop the JNF, Stolen Homes/Airbnb, and Stop G4S. Because they include groups dedicated to Israel's elimination and single out Israel for criticism while they ignore other nations with severe human rights abuses, BDS campaigns are considered inherently anti-Semitic. U.S. District Court Judge Sharon Johnson Coleman not only vacated her earlier dismissal of the case, she also authorized limited discovery in the case. "[T]his Court placed too much weight to defendants' declarations without providing plaintiffs with the opportunity to conduct limited jurisdictional discovery on the existence of an alter ego relationship. Accordingly, this Court will vacate its previous order dismissing the case ... and permit plaintiffs to conduct discovery solely to address jurisdiction." This is a major victory for the family of 17-year-old David Boim. He was shot dead in Israel in May 1996 by Hamas terrorists. In a historic judgment, Boim's parents Stanley and Joyce Boim won $156 million in damages against the Islamic Association for Palestine (IAP) and other members of the U.S. Hamas support network called the "Palestine Committee." The Committee was created by the Muslim Brotherhood to advance Hamas' agenda politically and financially in the United States. Inside a Kansas City auditorium in 1989, a masked man stepped to a lectern and described in Arabic the "oceans of blood" spilled in Hamas' armed attacks on Israeli soldiers and civilians. An internal 1992 IAP document, "Islamic Action Plan for Palestine," makes at least four specific references to Hamas, including its leadership role in the Palestinian intifada through "a lot of sacrifices from martyrs, detainees, wounded, injured, fugitives and deportees..."
IAP was among the first organizations the Muslim Brotherhood created in North America to specifically focus on the Palestinian cause, even preceding the Palestine Committee, the document said. Among the Palestine Committee's tasks, "Asking the countries to increase the financial and the moral support for Hamas." At the time of the Boim judgment in 2004, IAP and other defendants claimed they were no longer in business and had no money to pay the damages. But that was a ruse, the Boims' attorneys say, alleging that the defendants formed new organizations like the American Muslims for Palestine to escape their legal responsibility to pay damages. Successor groups, or alter egos, of organizations previously found liable for providing material support to Hamas need to pay the remaining judgment, the new litigation argues. 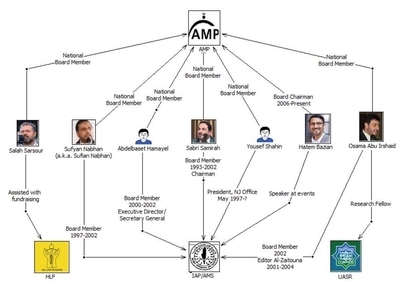 In 2015, the Investigative Project on Terrorism (IPT) first identified at least five AMP officials and speakers who worked in the Hamas-supporting "Palestine Committee." "We are ready to sacrifice all we have for Palestine. Long Live Palestine," Samirah said. "We have a mission here [in the U.S.] also to support the struggle of our people back there in order to achieve a free land in the Muslim world, without dictators and without corruption." 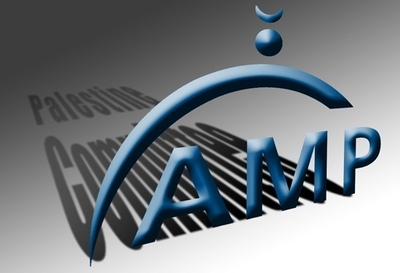 The Boims' attorneys say that AMP's current leadership and donors are "significantly identical" to their Palestine Committee branches, including the Holy Land Foundation for Relief and Development (HLF), Islamic Association for Palestine (IAP), and the American Muslim Society (AMS) which served as another name for the IAP. Rafeeq Jaber, a defendant in the new lawsuit, is a former IAP president and is now AMP's registered agent in Chicago. AMP President Abdelbasset Hamayel was IAP's secretary general. AMP's conferences and other events are identical in their pro-Hamas message to conferences held earlier by IAP, including overlapping speakers' lists. Abuirshaid served as editor of IAP's Arabic periodical, Al-Zaytounah, a mouthpiece for pro-Hamas propaganda. The magazine also published advertisements by terrorist-tied charities, including HLF, the Global Relief Foundation (GRF), and the Benevolence International Foundation (BIF). UASR published an academic journal that prosecutors in the HLF case say was "involved in passing Hamas communiques to the United States-based Muslim Brotherhood community and relaying messages from that community back to Hamas." Abuirshaid has openly expressed support for Hamas. He criticized Egyptian leader Abdel Fattah el-Sisi in a 2015 tweet for designating Hamas as a terrorist organization. Calling Egypt's capital "Cairo Aviv," Abuirshaid dismissed the move: "Look who's talking!? A terrorist murder regime." In a 2014 article written in Arabic, he praised the "Palestinian resistance" against the "Zionist aggression" in Hamas-controlled Gaza: "The facts of the current Zionist aggression have clearly shown that the Palestinian resistance is no longer in the position of receiving slaps without the response of some of them, and even many of them responding. It also showed the creativity of the resisting Palestinian mind, consistent with the severity of its being unyielding with long-range rockets, high-explosive missiles and bombs, and unmanned aerial vehicles, most of which are domestically manufactured, being designed to attack the enemy at the doorstep of its military bases by sea, landing behind its lines through tunnels, etc. It is a slap that Israel receives from the Resistance every day, and it finds no response except through the cowardly weapon of targeting civilians with artillery, air and sea missiles to raise the human and economic costs of the Palestinians." Abuirshaid has also praised Hamas war tactics: "There is a difference between Hamas, whose youth renewed their adherence to their starting point determined on liberalization, and Fatah, which has grown old after deviating from the creed of liberation and resistance upon which it was established." "There is a difference between those who resist and those who compromise; between those who constitute an army for liberation, and those who ready battalions of lackeys; a difference between those who rise up for the blood of martyrs, and those who spill it in the wine glasses of Israel," he added. At a conference last week hosted by the Muslim American Society (MAS) and the Islamic Circle of North America (ICNA), Abuirshaid tried to erase Jews' historical claim to Israel. He claimed the "Zionist Project" is a "form of apartheid" that seeks to "Judaize" Palestine. "In creating false Zionist historical and religious narratives, it's a deliberate attempt to deny the indigenous people of Palestine, us, from their rights and their own land. And Jerusalem is the bedrock to forge and falsify the history of Palestine and Judaizing it," he said. That's the kind of message that would have fit right in with any of the Palestine Committee groups. When the suit was originally filed last May, the Boims' attorneys issued a statement explaining that Abuirshaid and the other defendants "directed and controlled the organizations in 1996 ... that are legally obliged to pay the judgment won by the Boims. "These defendants cannot escape their legal liability and accountability for murder by merely changing the names of their organizations," they said.